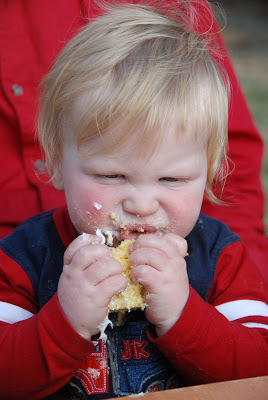 We are on struggle street lately when it comes to sharing. 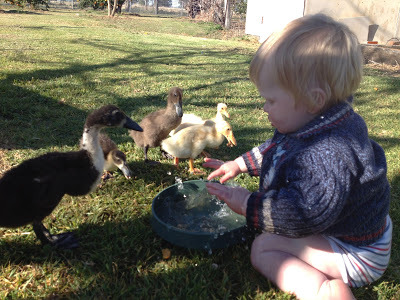 Especially the Muddy Puzzler and the Muddy Baby Boy, they flat out do not like to share. It could be a drink cup, a bunch of grapes, a shovel in the garden, an elastic, anything, if one has it the other wants it, and they will do anything to either hold onto it or try and get it off the other. No amount of negotiations will help, no amount of bribery or coercion, it’s just flat out no sharing. It has worn pretty thin, the tantrums, the tears, the fights, that is one thing they are both happy to do together, cry. I can tolerate the odd tantrum but when the two of them are home together it goes for most of the day. We are managing at the moment by being outside as much as possible and sending them to opposite corners of the garden, but as Jack Frost has also started visiting the time outside is getting shorter so I am in search of new strategies to stop the carry-on. 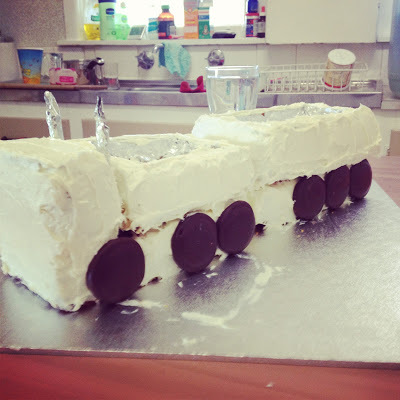 Baking works as long as they both have identical utensils, books work provided they are both allowed to sit on a knee, and that is where I have run out of ideas…….If you have any tips to help them learn to share or keep them separated I am willing to give them a go! 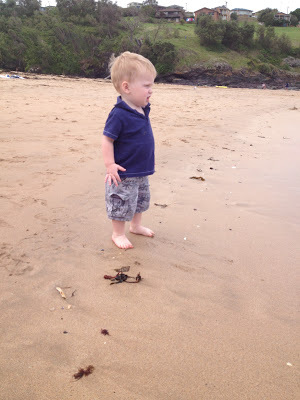 This entry was posted in Mother Angst, Muddy Bubby, Muddy Puzzler, Ramblings on June 19, 2013 by nat. 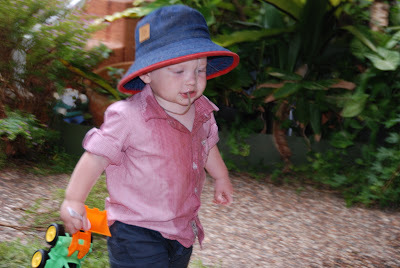 I am feeling strangely reminiscent this week, I have been looking at old photos of the Muddy Girls at the same age my Muddy Baby Boy is now – almost 20 months, which other than the tantrums is one of my favourite ages. 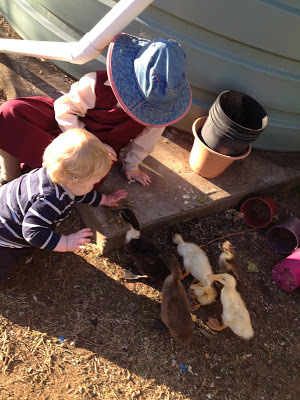 They are into everything, exploring, emptying cupboards, climbing everything. I am amazed though at the differences as well between all my kids at this age, from their interests to their skills development they are all so wonderful and individual. By far though my Muddy Baby boy has proved the most physically challenging, as I run to try and catch him before he falls, or run after him as he takes off out of the house yard and toward the shed, or rescue him from the tree he has just climbed, or wrestle him down to change his nappy, or keep him challenged inside on a rainy day when he’s an outside kid. 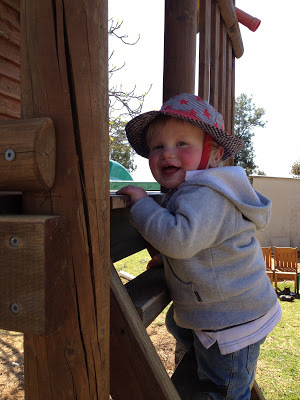 He is a boy through and through and I am loving every second of it, including the tantrums. 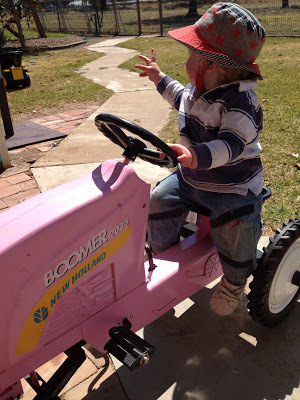 This entry was posted in Muddy Bubby, Photos, Ramblings on April 16, 2013 by nat. 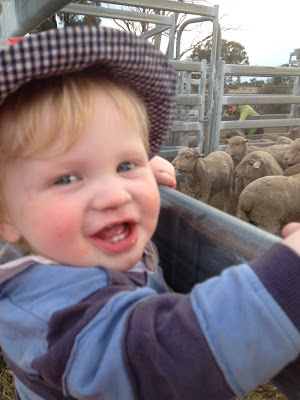 Muddy Baby Boy – Enraptured with the sheep running out of the pens after crutching. 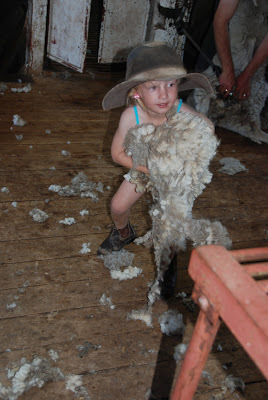 Muddy Pixie – Insisted on wearing a singlet just like Muddy Hubby does in the shearing shed, learning how to pick up the crutchings and pick them, has made me so proud this week. Sadly this week I only have two images of my Muddy Kids to share. I agree with Jodi when she says once they are at school, it is so hard to capture all that you want of them. Joining in with Jodi from Che and Fidel for 52 – A Portrait a Week for 52 weeks in 2013. 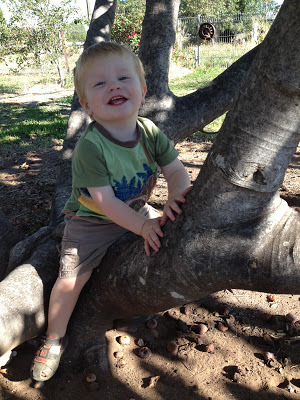 This entry was posted in 52 - A Portrait a Week, Muddy Bubby, Muddy Pixie, Photos on February 24, 2013 by nat. With my 3 Muddy Girls the biggest drama I had/have is probably their introvertness (not sure that it’s a word but works for me), now with my Muddy Baby Boy it is the total opposite. He is a real Mr Independent, happy to go off on his own, or preferably with Muddy Hubby if he can. 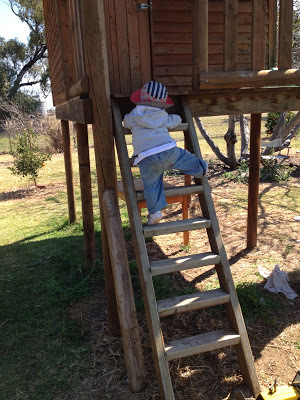 He is an explorer, a constant little boy in motion, seeking out his next big adventure. Packaged with his independence is his determination, his determination to do whatever his big sisters are doing, or whatever takes his fancy at the time really. 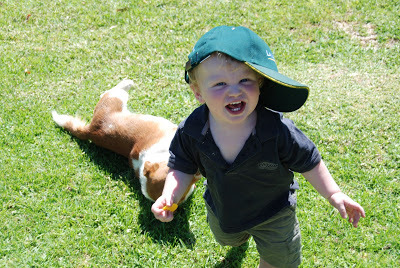 As much as I love it, it is certainly keeping me on my toes and some days I honestly struggle with how to parent him. 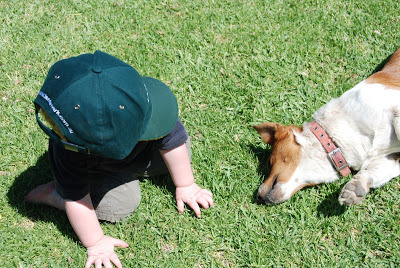 If he is told ‘No’ or ‘Stop’ he lays down on the ground and chucks a massive tantrum. If we go walking and he wants to stop, he just sits down, there’s no carrying him, he will get up and keep going when he is ready. If he sees something he wants there is no stopping him until he gets it, even if it means falling off the table in the process or banging into things as he pushes his way through, there is no fear, just total focus on his objective. Some days I long to be like that, so I can’t really complain because it’s a trait I admire, but it sure does make some days challenging. 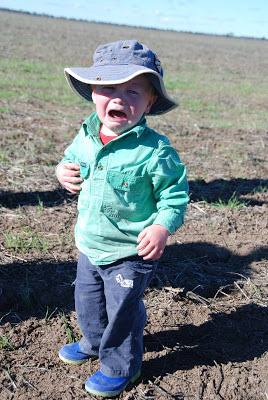 This entry was posted in Mother Angst, Muddy Bubby, Photos on February 21, 2013 by nat. 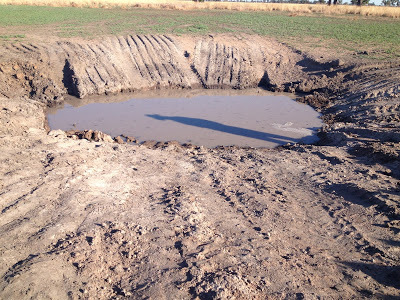 There’s been some excavation work going on, on the farm, and I think everyone, including Muddy Hubby, is just a tad excited. On one of the blocks we have always had a wet patch, after the floods and heavy rain it was almost like a swamp with bird life and marshes. 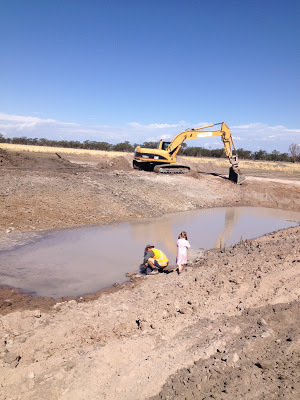 Rumour had it, it’s where there used to be an old well on a spring, so they’ve been doing a little digging, and lo and behold they struck water. 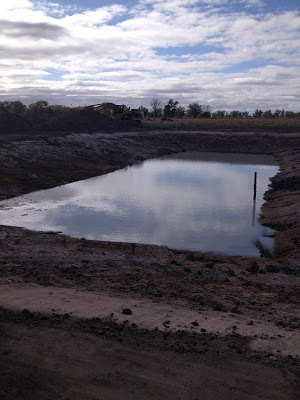 So they decided it would be as good a place as any to put a dam, so it has two methods of filling, one from the natural spring and one from the rainwater runoff, a win-win situation really. 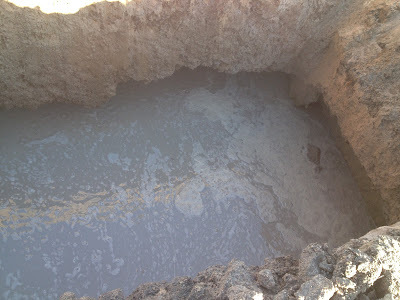 They called in the excavator and he dug a test hole, which once he broke through the hard crust, struck water underneath. 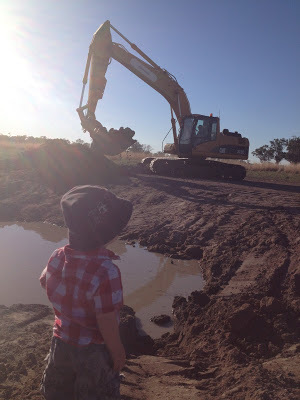 He then began the digging process, working his way from the centre point of the dam to the outside, Muddy Bubby was in awe of the machine. 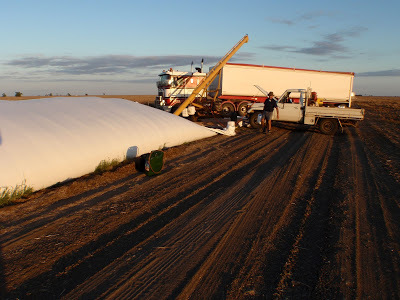 This is what it looked like by the end of the day. This is what it looked like this morning, with water filling from the spring. 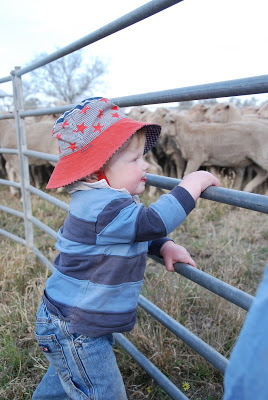 The sheep will no doubt soon be down to check it out, do a taste test on the water and probably camp next to their new paddock addition. 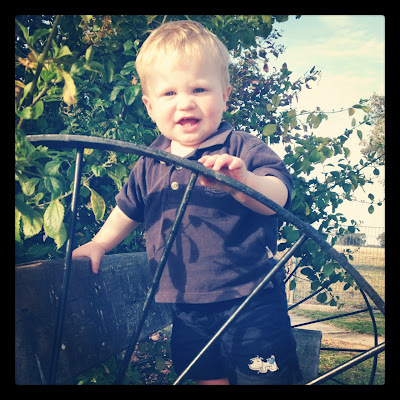 This entry was posted in Farm, Muddy Bubby, Photos on February 2, 2013 by nat. We have a sacrificial snake dog, he’s a Jack Russell and his name is N-G-O, he’s a cheeky character, who from day one has refused to sleep in his kennel and has camped under our bedroom. The Muddy Girls have always loved him, they play with him on and off, but if he’s not there they are not fussed. My Muddy Baby Boy thought is enraptured by him, he seeks him out, he chases him, he rolls on the grass with him, pats him, wrestles him and just sits companionably with him. They have this special bond that the Muddy Girls don’t have. I just love to watch them together, it makes me smile every time. 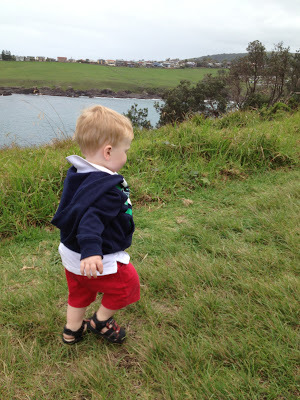 This entry was posted in Muddy Bubby, Photos on December 19, 2012 by nat. I will warn you in advance, this post is about Poo, read on if you like or walk away like I wished I could have at the time…. Most Days I love being a parent, no matter how hard the day is, I still feel so blessed to have 4 beautiful healthy children. 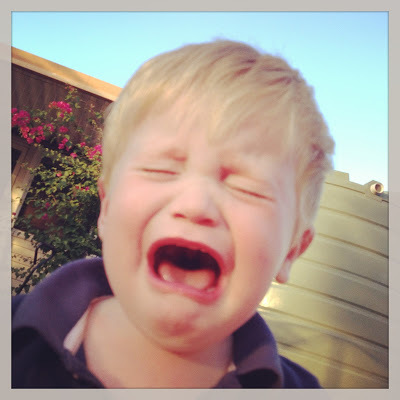 The whinging the whining, the tantrums it’s all part of parenting. 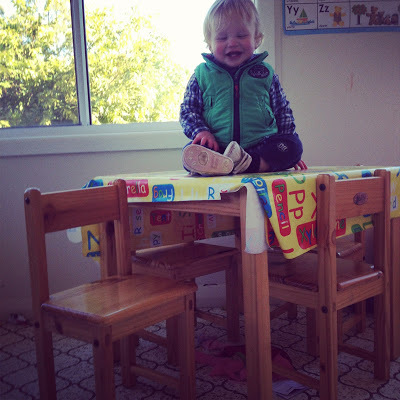 The messy house, the crumbs everywhere, the toilet training, it’s all good. Some days though there are things that make me stop and go ‘Did I really sign up for this?’. I looked and yes sure enough it was half covered in Poo. As I was gagging I asked how it happened, ‘He put it in the toilet’ she said, ‘but why has it got Poo’ on it I asked. ‘Because I didn’t flush my poo’. There quite simply, she forgot to flush, something I thought I would have taught her as a parent and reinforced over and over again, but no, it is a parenting fail, one that won’t be happening again, I have repeated the phrase over and over to them since it happened ‘Remember to flush’. We disinfected everyone and the toilet, we disinfected the cup, and ran it under hot, hot, water for ages, I then washed it, and then because I can never look at it in the same way again, I threw it out. Yes I felt wasteful, but at least I don’t have to look at it and gag every time I see it. 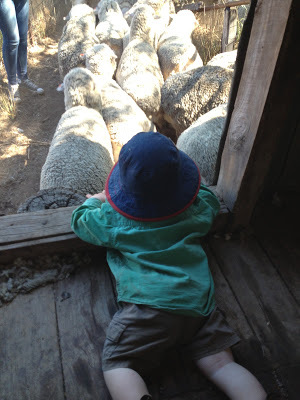 And still I think ‘Did I really sign up for this?’ Do you have those moments too? Please tell me I’m not alone in wondering if this was part of the deal of parenting? 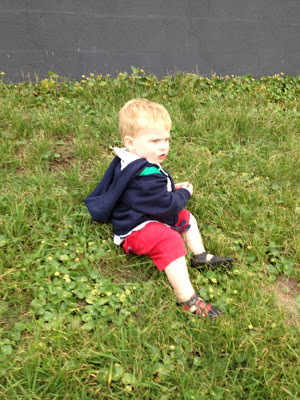 This entry was posted in Mother Angst, Muddy Bubby, Muddy Pixie on October 11, 2012 by nat. 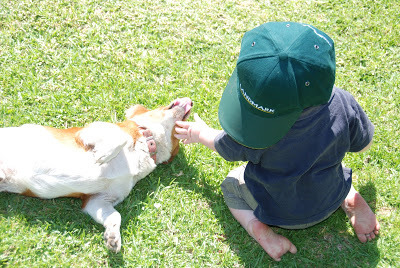 This week my Grateful post is simple….I am grateful for the chance to be a Mum. Everyday since I have been a Mum I have been so grateful for being so blessed. These past two weeks though as I’ve watched my Muddy Baby Boy go from ‘baby’ to ‘little boy’ in the blink of an eye I am extra grateful for having the chance to be a Mum to a Handsome Muddy Boy, as well as 3 gorgeous Muddy Girls. Each day he challenges me in different ways to the Muddy Girls at the same age, whether it’s climbing whatever he can, trying to run before he walks or just trying to change his nappy. Each Day he gives me a different set of clothes to hang on the line, rather than just shades of girl. 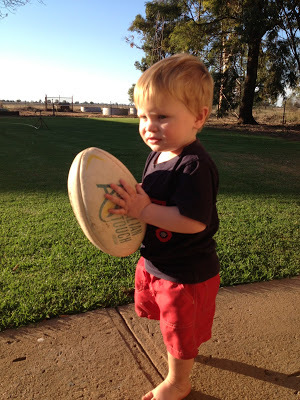 Each day he makes me feel very blessed for the chance to be his Mum. I can 100% honestly say that it would not have mattered to me if he had been born a girl, as long as he arrived safe and healthy I considered myself lucky. When he arrived I was a little in shock (I had all the girls baby clothes ready to go again) and each day I see him grow and change I am so grateful that he is mine to love and care for and that I have the chance to be his Mum. 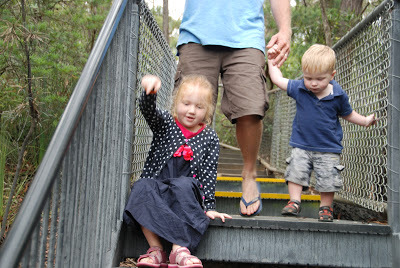 Linking up with Maxabella over at Village Voices for 52 Weeks of Grateful. 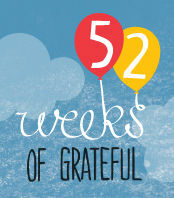 What are you Grateful for this week? 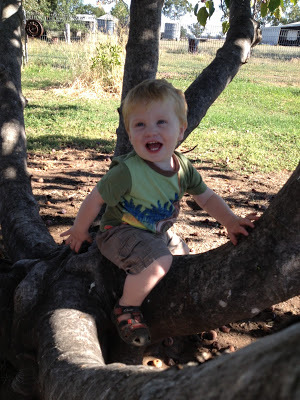 This entry was posted in 52 Weeks of Grateful, Muddy Bubby, Photos on September 27, 2012 by nat. 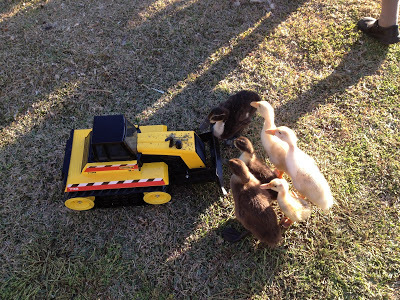 We’ve had our Indian Runner Ducklings for a couple of weeks now and we’ve started to let them wander around the house yard during the day, then we put them back in their box at night with a warm light so they don’t get cold. 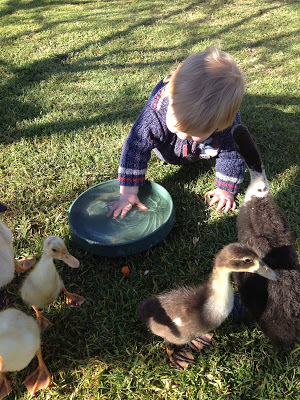 They are getting bigger and cuter by the day and they must think Muddy Bubby is alright, as they tend to follow him around, they let him share their water dish and come looking to him when they’re hungry. There is still one that’s a little bit of a runt, her name is ‘Sprinkles’ and all the Muddy Kids want to hold her and pick her up and put her in the box at night. I’m hoping she gets a growth spurt soon, otherwise she’ll be left in the box alone at night as the others are growing too big! 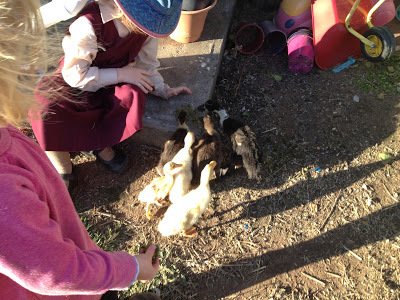 We also said goodbye to our pigs this week, they’ve gone away to become Christmas Ham and Pork Roast so we don’t have to worry about losing our Ducks to the pigs the way we ended up losing 3 chickens. 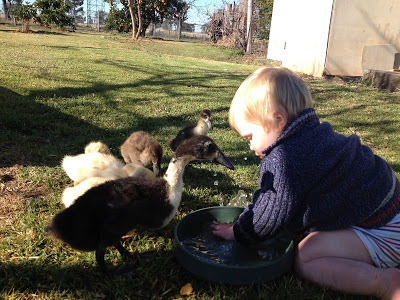 My next addition will be restocking the chooks, so we can get some eggs coming back in! 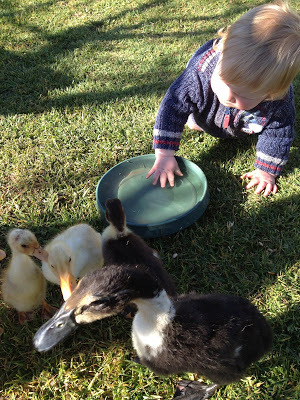 This entry was posted in Family, Farm, Muddy Bubby on August 30, 2012 by nat. 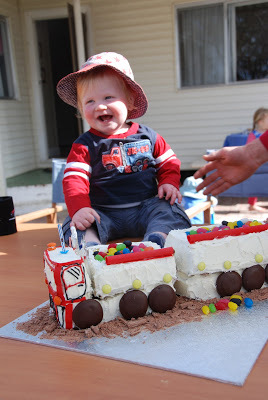 I mentioned on Friday I was going to make a proper birthday cake for Muddy Bubby to appease my mother guilt. I had ummed and ahhed about just what to make. 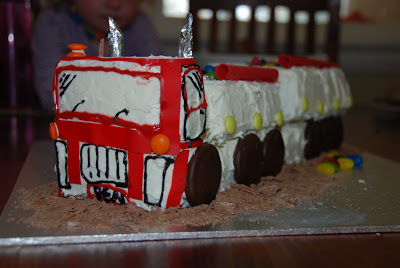 The wonderful Jo at Country Life Experiment and her talented Country Boy had made their two year old a fantastic truck cake for his birthday. So using this as my starting point I made a truck based around our truck (see photo below). 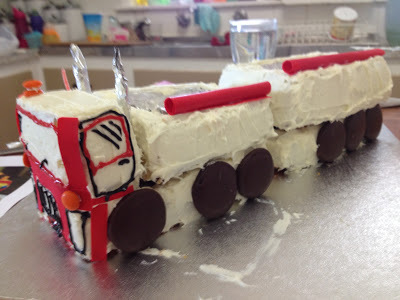 It was really pretty simple to construct, because I made two trailers I needed 4 loaf cakes. I made a butter cake and froze them, so they were easier to cut to shape. 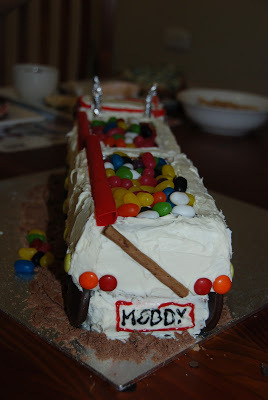 Then I crumb iced it, before putting on the final coat of icing and the decorations, including two trailers with jellybeans. Overall I was pretty happy with it, and I think Muddy Bubby and Muddy Hubby were too! 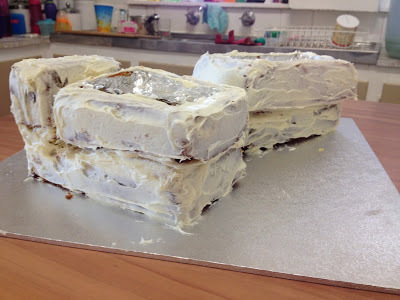 The hardest part was definitely the gel icing for writing and drawing. No matter how hard I try I just can’t get it to come out without blobs in it! 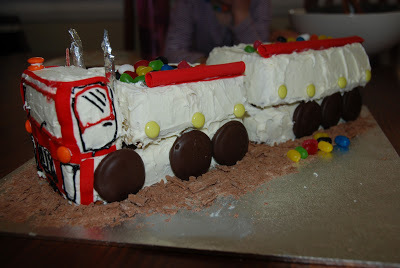 This entry was posted in Family, Muddy Bubby, Recipes on August 27, 2012 by nat.